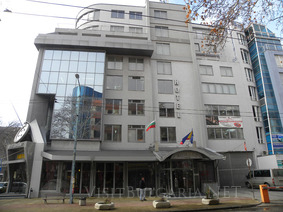 Plovdiv, 7 Vassil Aprilov Blvd. Location: Alliance hotel is situated in the centre of Plovdiv, just a three-minutes walk from the Plovdiv Railway Station and a ten-minutes drive from the Plovdiv International Fair. The Old Town of Plovdiv is just at a 15 minutes walking distance from the hotel. Accommodation: The hotel offers 86 beds in single rooms, double rooms and suites. Each standard room is equipped with Air-conditioning system, Mini-bar, Cable TV with over 50 channels in different languages, bathrooms with showers and tubs, Direct telephone, Internet, Radio, Twin beds or a king-sized bed. Each suite is equipped with Air-conditioning system, kitchen box, Mini-bar, Cable TV with over 50 channels in different languages, bathroom with shower, tub and jaccuzi, Direct telephone, Internet, Radio, Luxury Sofas, Luxury bedroom with a King-sized bed. Bars and restaurants: Restaurant "Kopcheto" offers Bulgarian and international cuisine, variety of 120 different brands of wine of all sorts. The salons are fully air-conditioned, with a fireplace, large TV screen and perfect musical surround. Conference Hall: The conference hall is fully air-conditioned and heated. It is equipped with a multimedia device with a DVD player, satellite TV, audio system and a 180/200 screen; a 2 ISDN-channel video-conference connection system, a multifunctional flip-chart board, Internet connection and PC-networking. Sport: The fitness center is equipped with professional apparatus, Running bands, Rowing machine, Skiing machine, Cycling machine, Gladiator exerciser, weights etc.